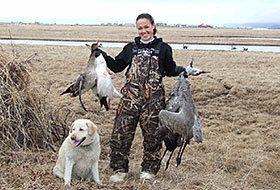 Alaska offers a variety of hunting opportunities, many of them world class. The options include taking kids grouse or hare hunting along back roads in the Interior, filling the freezer with muskox, or conducting a once-in-a-lifetime brown bear or mountain goat hunt in the Southeast rainforest or along the Southcentral coast. Some species, such as caribou and moose, are widely distributed across much of the state. However, depending on the month, animals may be scarce even where good habitat exists, but abundant elsewhere. Many big game species in Alaska make long migrations between their seasonal ranges. The keys to hunting successfully are careful planning and thorough preparation. Online bear baiting, Unit 23 pilot quiz, Delta bison orientation and more. Hunt planning, equipment, rules & requirements, & more. Hunt opportunities, harvest statistics, range maps, permit conditions, etc. Hunting maps, GMU information, area restrictions, GIS, & more. Subsistence hunting information & opportunities.